My job gave my a $100 gift certificate to Bloomingdale’s because I got married…another great reason to have done so. I promptly went to Bloomingdale’s and splurged on Daisy. It had just come out and they had a promotion going on. I got the perfume with lotion and gold lame cosmetic box (overkill!!) for 70 smackers. The saleswoman ( a Joan Rivers-esq upper eastsider who seemed to be doing this work for her own pleasure) also insisted that I take the “classy” “gold” bangle they were also handing out. I frankly could have done without all the hullabaloo but I love the perfume. It’s delicious. I hope I never become immune to it. It smells like goodness. I’m not sure how to describe perfume’s (or wine’s for that matter) subtle notes. Nonetheless, Daisy is so lovely. My old favorite Coco Madmoiselle is off the the wayside for now. This post is very femme. 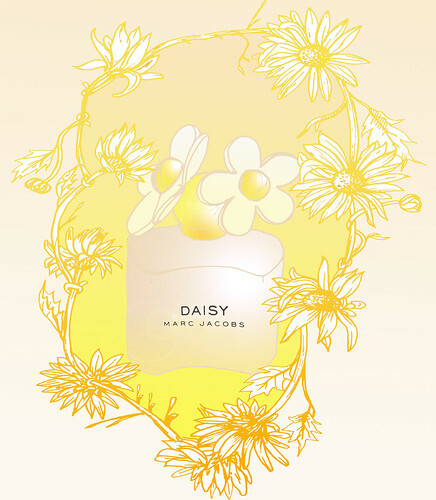 But consider it unisex in that if you are not a girl you may know one who would love to smell like Daisy…and gift giving season is around the corner. I’m going away for the holiday weekend. I hope all my friends and readers have a beautiful and delicious holiday. I’m thankful for you all! I have lots to post about so look for a new post on Sunday.